Advantages: Comprehensive photo coverage; logical structure of colour walkaround photos; line drawings, scrap views and tables enhance the text; 54 attractive colour profiles; colour walkaround section. Disadvantages: Some photos quite small; very brief coverage of variants etc. 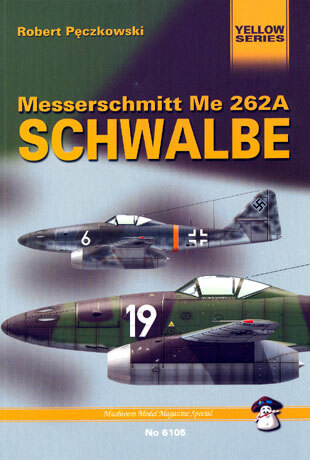 Mushroom Model Publication's latest book is "Messerschmitt Me 262A SCHWALBE" by Robert Pęczkowski. The book comprises 96 pages in 9.5" x 6.5" format, with soft covers and including a 27 page colour profile section and a further 37 pages of colour walkaround photos. The first 23 pages cover the variants of the Messerschmitt Me 262A with brief text, line drawings and historical photographs (although not all variants have photo coverage). With such a broad subject covered in such a short space, this is a very brief summary. Many variants only get a single page. This introductory section is followed by a summary of armament, then the airframe is examined in detail by way of mostly colour photos. A variety of museum aircraft have been photographed for this section. The airframe photos are logically broken down by the section of the aircraft (eg fuselage, wings, cockpit etc), and the quality of the photos is very good. They will certainly be helpful to modellers wanting to know the colours and details of the Me 262. The 27 page colour profile section includes 52 side profiles and two plan view illustrations. The illustrations are well done, with depiction of light, shade and weathering on all subjects. Plenty of modelling inspiration here too! If you do not have a stack of specialist titles on this subject, "Messerschmitt Me 262A SCHWALBE" will be a handy and compact introduction to the Me 262, with the added bonus of 54 attractive colour profiles.